The Ashikaga shogunate (足利幕府, Ashikaga bakufu, 1336–1573), also known as the Muromachi shogunate (室町幕府, Muromachi bakufu), was a dynasty originating from one of the plethora of Japanese daimyō which governed Japan from 1338 to 1573, the year in which Oda Nobunaga deposed Ashikaga Yoshiaki. The heads of government were the shōgun. Each was a member of the Ashikaga clan. This period is also known as the Muromachi period. It gets its name from the Muromachi district of Kyoto. The third shōgun, Ashikaga Yoshimitsu, established his residence on Muromachi Street. This residence, constructed in 1379, is nicknamed "Flower Palace" (花の御所, Hana no Gosho) because of the abundance of flowers in its landscaping. During the preceding Kamakura period (1185–1333), the Hōjō clan enjoyed absolute power in the governing of Japan. This monopoly of power, as well as the lack of a reward of lands after the defeat of the Mongol invasions, led to simmering resentment among Hōjō vassals. Finally, in 1333, the Emperor Go-Daigo ordered local governing vassals to oppose Hōjō rule, in favor of Imperial restoration, in the Kenmu Restoration. To counter this revolt, the Kamakura shogunate ordered Ashikaga Takauji to quash the uprising. For reasons that are unclear, possibly because Ashikaga was the de facto leader of the powerless Minamoto clan, while the Hōjō clan were from the Taira clan the Minamoto had previously defeated, Ashikaga turned against Kamakura, and fought on behalf of the Imperial court. After the successful overthrow of the Kamakura regime in 1336, Ashikaga Takauji set up his own military government in Kyoto. After Ashikaga Takauji established himself as the shōgun, a dispute arose with Emperor Go-Daigo on the subject of how to govern the country. That dispute led Takauji to cause Prince Yutahito, the second son of Emperor Go-Fushimi, to be installed as Emperor Kōmyō. Go-Daigō fled, and Japan was divided between a northern imperial court (in favor of Kōmyō), and a southern imperial court (in favor of Go-Daigō). This period of "Northern and Southern Courts" continued for 56 years, until 1392, when the South Court gave up during the reign of Ashikaga Yoshimitsu. The Ashikaga shogunate was the weakest of the three Japanese military governments. Unlike its predecessor, the Kamakura shogunate, or its successor, the Tokugawa shogunate, when Ashikaga Takauji established his government he had little personal territory with which to support his rule. 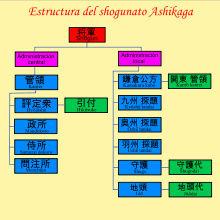 The Ashikaga shogunate was thus heavily reliant on the prestige and personal authority of its shōgun. The centralized master-vassal system used in the Kamakura system was replaced with the highly de-centralized daimyōs (local lord) system, and because of the lack of direct territories, the military power of the shōgun depended heavily on the loyalty of the daimyō. On the other hand, the Imperial court was no longer a credible threat to military rule. The failure of the Kenmu Restoration had rendered the court weak and subservient, a situation the Ashikaga Takauji reinforced by establishing within close proximity of the Emperor at Kyoto. The authority of the local daimyō greatly expanded from its Kamakura times. In addition to military and policing responsibilities, the shogunate appointed shugos now absorbed the justice, economical and taxation powers of the local Imperial governors, while the government holdings in each province were rapidly absorbed into the personal holdings of the daimyō or their vassals. The loss of both political clout and economic base deprived the Imperial court of much of its power, which were then assumed by the Ashikaga shōgun. This situation reached its peak under the rule of the third shōgun, Ashikaga Yoshimitsu. After Yoshimitsu however, the structural weakness of the Ashikaga shogunate were exposed by numerous succession troubles and early deaths. This became dramatically more acute after the Ōnin War, after which the shogunate itself became reduced to little more than a local political force in Kyoto. The Ashikaga shogunate's foreign relations policy choices were played out in evolving contacts with Joseon on the Korean Peninsula and with imperial China. As the daimyō increasingly feuded among themselves in the pursuit of power in the Ōnin War, that loyalty grew increasingly strained, until it erupted into open warfare in the late Muromachi period, also known as the Sengoku period. When the shōgun Ashikaga Yoshiteru was assassinated in 1565, an ambitious daimyō, Oda Nobunaga, seized the opportunity and installed Yoshiteru's brother Yoshiaki as the 15th Ashikaga shōgun. However, Yoshiaki was only a puppet of Nobunaga. The Ashikaga shogunate was finally destroyed in 1573 when Nobunaga drove Ashikaga Yoshiaki out of Kyoto. Initially, Yoshiaki fled to Shikoku. Afterwards, he sought and received protection from the Mōri clan in western Japan. Later, Toyotomi Hideyoshi requested that Yoshiaki accept him as an adopted son and the 16th Ashikaga shōgun, but Yoshiaki refused. The Ashikaga family survived the 16th century, and a branch of it became the daimyō family of the Kitsuregawa domain. The shogunal residence, also known as the "Flower Palace", was in Kyoto on the block now bounded by Karasuma Street (to the east), Imadegawa Street (to the south), Muromachi Street (to the west, giving the name), and Kamidachiuri Street (to the north). 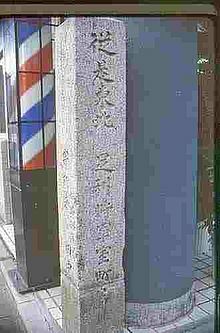 The location is commemorated by a stone marker at the southwest corner, and the Kanbai-kan (寒梅館, Winter Plum Hall) of Dōshisha University contains relics and excavations of the area. ^ a b Nussbaum, Louis-Frédéric. (2005). "Muromachi-jidai" in Japan Encyclopedia, p. 669. ^ Roth 2002, p. 878. ^ Roth 2002, p. 53. ^ von Klaproth 1834, p. 320. ^ Kang 1997, p. 275. ^ Ackroyd 1982, p. 329. ^ von Klaproth 1834, pp. 322–324. ^ With the end of the Kitsuregawa line following the death of Ashikaga Atsuuji in 1983, the current de facto head of the family is Ashikaga Yoshihiro, of the Hirashima Kubō line. ^ a b c d Roth 2002, p. 55. ^ a b c d e f g h Roth 2002, p. 56. ^ a b c Roth 2002, p. 57. 新井 Arai, 白石 Hakuseki; Ackroyd, Joyce Irene (1982). Lessons from history: the Tokushi yoron. University of Queensland Press. ISBN 978-0-7022-1485-1. Kang, Etsuko Hae-Jin (1997). Diplomacy and Ideology in Japanese-Korean Relations: From the Fifteenth to the Eighteenth Century. Palgrave Macmillan. ISBN 978-0-312-17370-8. Nussbaum, Louis-Frédéric; Roth, Käthe (2002). Japan Encyclopedia. Harvard University Press. ISBN 978-0-674-01753-5.
von Klaproth, Julius (1834). Nipon o daï itsi ran: ou Annales des empereurs du Japon. Oriental Translation Fund.